Your grass’ roots are like Olympic swimmers. They do most of the work under the surface but need to come up for air to keep going. Aerating warm-season grasses such as Bermuda, Buffalo or St. Augustine lets that happen. Aeration is the process of perforating your soil to get rid of compaction and enable proper circulation of air, water and nutrients. That nourishment then reaches the yard’s root system and encourages it to grow deeper. Your grass may even tell you if it needs to be aerated. There are three ways to aerate your lawn. Using a core aerator is the most effective way to aerate your lawn. It will create larger holes for more air, water and nutrients to be absorbed. Core aeration. This is the most effective of the three. Columns of soil are removed and placed on the lawn’s surface. The larger holes allow for more air, water and nutrients to be absorbed. Spiking. In a much simpler process, tines — or prongs — are used to poke holes into the soil. Slicing. Rotating blades are used to puncture the soil. Using the spiking or slicing method is less noticeable than core aeration but these methods don’t allow essential nutrients to burrow as well. 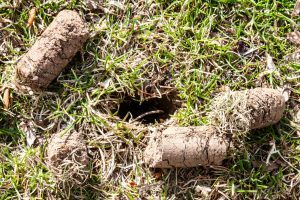 While lawn aeration may seem as easy as simply poking holes in your grass, there are steps you will want to follow to make sure you do it correctly. The best time to aerate is when your lawn is semi-moist. 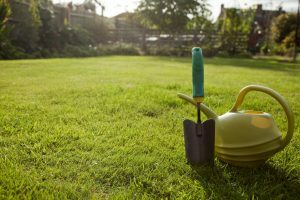 Use a trowel to test the level of moisture in your lawn. If the soil sticks to the trowel, it is too wet to aerate. If you can’t plunge it in without a lot of effort, give your lawn a good watering or wait until after the next rain. Use a trowel to test the soil’s moisture. Aeration becomes much harder if the soil is too dry or too wet. Ideally, you want the soil to be moderately moist before you start. Plunge a trowel several inches into the ground. If the soil sticks to it when you pull it out, it’s too wet for aeration. If you can’t plunge it in without a lot of effort, give your lawn a good watering or wait until after the next rain. Mark all sprinkler heads with landscape flags or paint. This will help you avoid accidental (and potentially expensive) damage to your in-ground irrigation system. Make a grid. Most aeration machines only cover a small area. You’ll need to make multiple passes to cover your whole yard. To ensure you’ve aerated it all, go north to south on one pass, then east to west. Don’t bother raking. Leave the pulled soil plugs on the lawn. They will decompose and re-fill the soil with nutrients. After you aerate, you can leave the plugs on the lawn. Once they are dry, mow over your lawn to distribute. Once the plugs are dry, cut the grass short to help the nourishment process go faster. Pass over the lawn twice with your mower, going in opposite directions to break up and spread the plugs. Then water the lawn to help dissolve the removed soil. 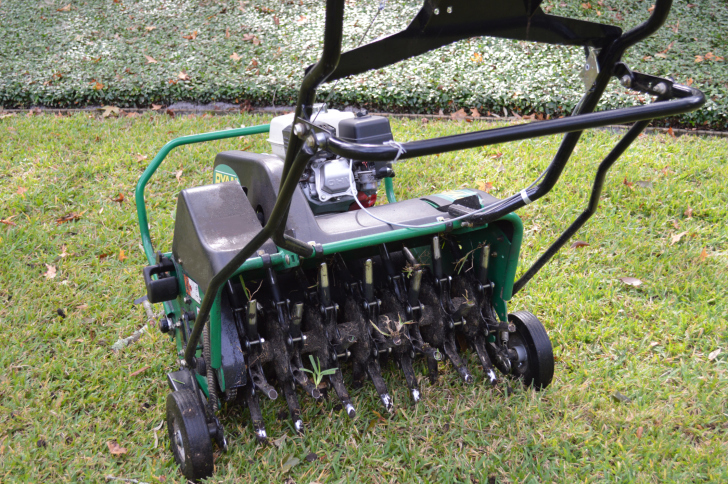 How often you aerate your lawn depends on how you use it. If there are no pools of water collecting, excess water runoff or worn areas where the grass has stopped growing, you may only need to aerate your lawn every three to five years. Yards used frequently for games, backyard camping and other outdoor activities may become more compacted and need aerating every one or two years.